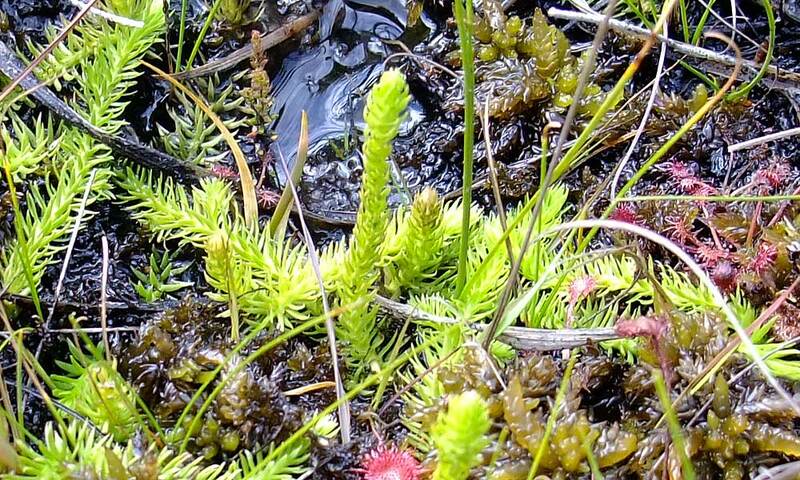 For an endangered and declining plant, Marsh Clubmoss has a lot of big numbers associated with it. For instance, clubmosses evolved some 400 million years ago and tree-sized clubmosses contributed to the coal swamps of the Carboniferous geological period. 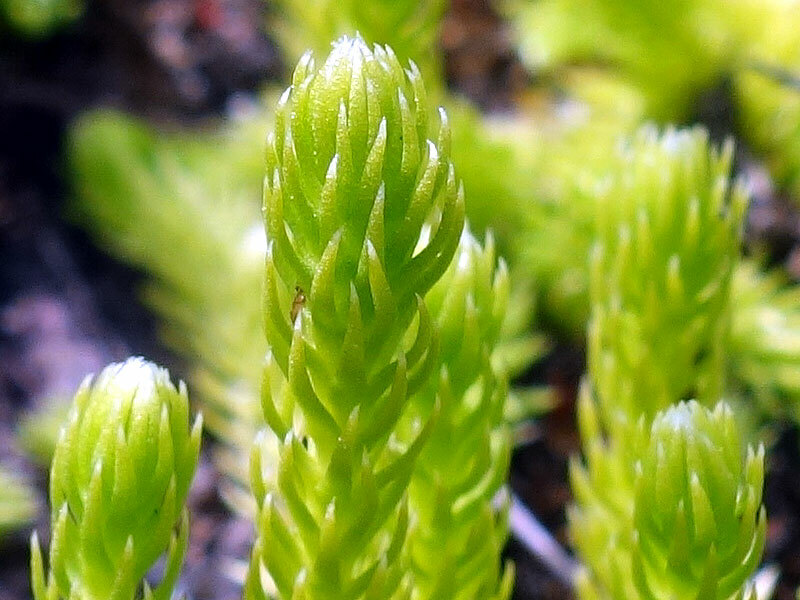 However, Marsh Clubmoss is quite small, usually just a few centimetres in height, and looks a bit like the tip nipped of the end of a conifer branch, and pokes upright in the ground. Each plant generally has two short creeping shoots arranged in a V, with an upright “club” arising from the join. In fact, clubmosses are neither moss nor of course conifer, but are closely allied to ferns. Like ferns, they have a two-stage life-cycle. The “clubs”, called strobili, produce 1000s of tiny spores. These spores germinate to produce the gametophyte stage of the plant, which produces eggs and sperm – but I’ve yet to meet anyone who has actually seen a Marsh Clubmoss gametophyte, and that is despite being lucky enough to see 1000s of plants this year! 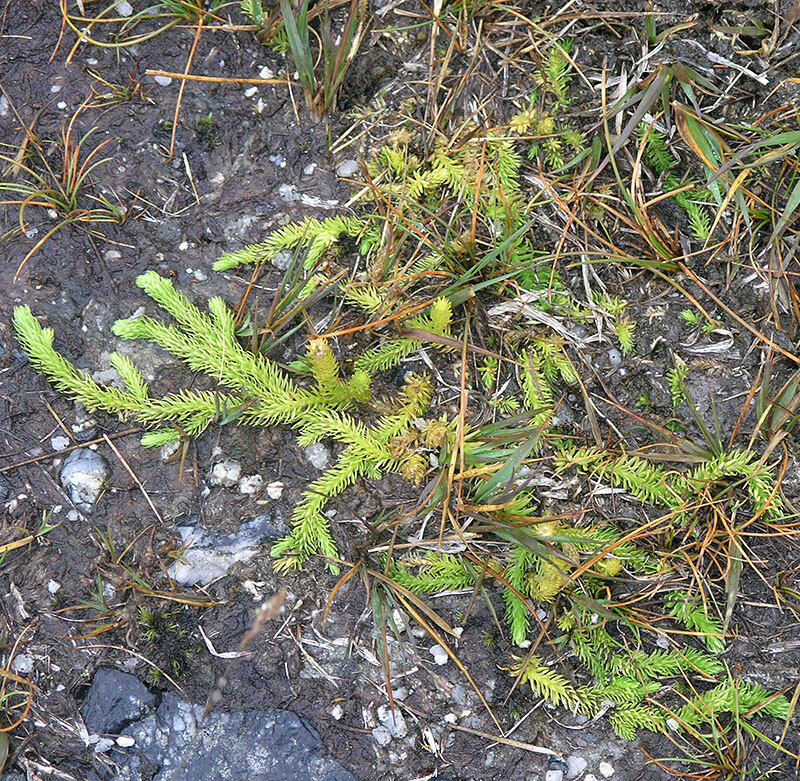 This is pretty amazing – Marsh Clubmoss can form sizeable colonies where it finds suitable conditions, but the gradual degradation of wet heath and valley mire, its preferred habitat, means that it has declined by (and here is an uncomfortably big number) 85% in the last 85 years and many colonies are tiny. Its classification as endangered is a reflection of the very real extinction risk it is facing in the wild. So how was I fortunate enough to see so many plants? Well, Marsh Clubmoss is one of the 19 species whose fortunes we hope to reverse through Back from the Brink in Dorset. Firstly, we’ve been working with the Species Recovery Trust and our volunteer survey team to check all the known sites in Dorset, bringing records up to date and making a better assessment of how it’s doing and where conditions need improving for the species. Secondly, we are trying to create ideal conditions to allow it to spread. In lowland England, Marsh Clubmoss is generally found on very open, peaty and often slightly compressed bare ground in wet heathland. This is often along the edges of tracks or livestock paths. It can also creep along the top of bog mosses out in wet valley mires. Low growing, it can’t tolerate being shaded out by other plants and is found where there is little by way of plant nutrients in the soil that would encourage the speedy growth of other plants. 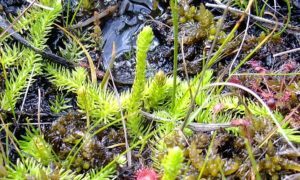 Marsh Clubmoss has a trick up its sleeve, because it has an association with a fungus called Mucoromycotina that it is thought may help it gain nutrients in these otherwise unfavourable conditions. In the past, bare ground was created on heathland by grazing livestock, cart tracks and also turf cutting for fuel, but grazing has declined and peat cutting no longer occurs. So, building on the experience of the Species Recovery Trust and working with Alaska Ecological Contracting, we’ve taken the unusual approach of using some big kit to scrape back the surface vegetation and expose areas of bare peat. Our volunteer survey team will be keeping a sharp eye on these plots over the next few years to see whether clubmoss arrives. We’ve also been trying a more unusual technique at an existing colony where Marsh Clubmoss was first spotted after a tractor scuffed up the peaty substrate. This was one of the biggest colonies in Dorset, and we counted 3,000 plants in 2017 – an impressive sight. However, we were aware that the colony probably wouldn’t persist in the long term, as other vegetation gradually regenerated. So we took a big breath, and last winter we asked RSPB’s Ecological Services to drive up and down over the area while they were on site carrying out other habitat restoration work. The result – a four-fold increase resulting in the phenomenal sight of around 12,000 plants! Definitely my favourite big number for Marsh Clubmoss. If you are local to Dorset and interested in volunteer surveys for Dorset’s Heathland Heart, do please get in touch.